Is this what we fought for? On the 21st of March, South Africans commemorated Human Rights day. In the post-Apartheid era, this day has been set aside to reflect on South Africa’s painful and racist past. It is a day of remembrance for the many that fought valiantly, some even paying the ultimate price so that all South Africans could live free and equal and no longer discriminated against. But racism is raising its ugly head once again in the Rainbow Nation. Over the past year, anti-Semitism has risen to alarming levels around the world and South Africa seems to have caught this dangerous virus. While anti-Semitism doesn’t manifest its nastiness in the same format as we have seen in Europe which is classified as more “traditional” but it is no less nefarious. At least in Europe, governments are expressing outrage and vowing to crack down on protagonists. In South Africa the silence is deafening. If we were looking at who the main culprits are, we would have to look no further than BDS South Africa. Not content with spewing their ridiculous calls for boycotts, divestment and sanctions, over the last year this band of hoodlums have gone as far to chant “shoot the Jew” at a concert given by an Israeli artist, embark on a campaign of thuggery against the popular chain Woolworths over the miniscule amount of produce they import from Israel and intimidate and threaten students on university campuses, especially during their annual hate festival, Israel Apartheid Week. Who can forget the infamous pigs-head incident and twits who tweet nasty? Several weeks ago, the Belligerent, Destructive and Stupid, demonstrated outside the venue where the South African Zionist Federation were hosting their conference. Screaming invective such as “You think this is Israel, we will kill you” and “You Jews do not belong in South Africa”, BDS and their supporters proved once again that their motivation is not concern for Palestinian Human Rights but rather a hatred and intolerance for Jews. Palestinian human rights activist, Basseim Eid, who was part of a delegation to combat the crazy on campus was verbally and physically assaulted and had to be escorted to safety by security. Woolworths again felt the wrath of the BDS supporters a few weeks ago when 21 youths between the ages of 16-18 descended on a branch in Pretoria armed with bricks and sharp objects. Chanting “Israel is the devil” they proceeded to loot and damage the store. “I was terrified, these kids were up in arms and ready for war” said one eye-witness. 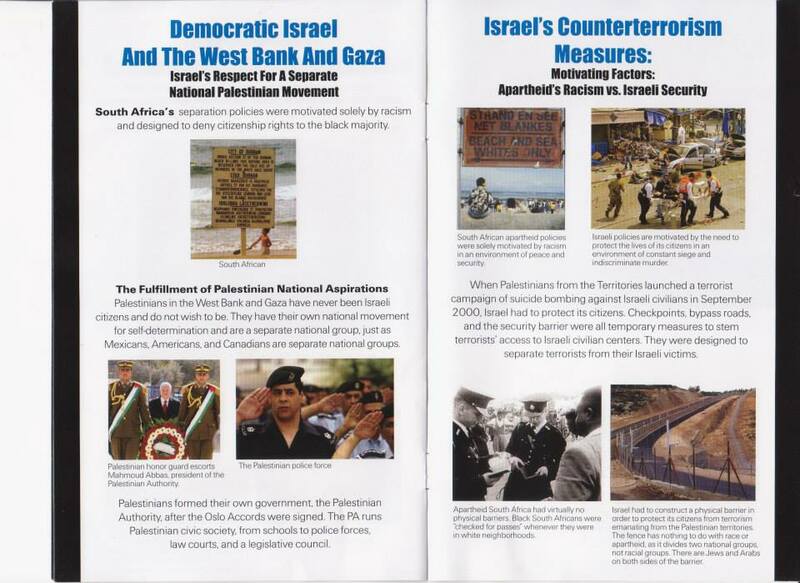 They left behind their evidence – BDS pamphlets – perhaps spending more time studying and less time looting would make for smarter criminal tactics! 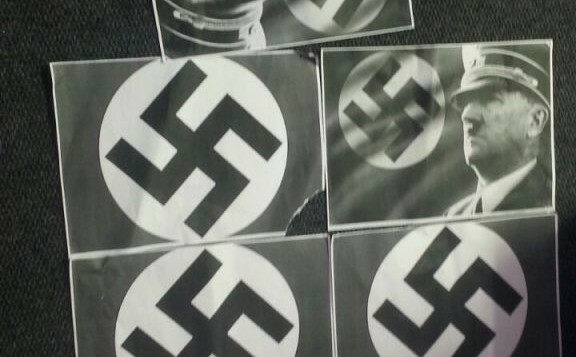 It seems that university campuses around the world are the prime hotbed of anti-Israeli activity and students at the University of Cape Town were shocked to the core to see pamphlets of Hitler and swastikas pasted to column s around school. While the intention was not specifically aimed at Jews but rather in protest against a statue of Cecil John Rodes, a British colonialist, the trauma and distress it caused the Jewish students cannot be ignored. This is an especially sensitive issue as hot off the heels of the visit by arch terrorist, Leila Khaled, whose claim to fame is airline hijacking, the Durban University of Technology called for the expulsion of Jewish students who do not support the Palestinian cause. Thank goodness that the Vice Chancellor issued an outright condemnation. The most recent cause for alarm was the verbal and physical assault of three kippa wearing teenage boys who went to watch a movie at popular Johannesburg mall, “The Zone”. They were accosted by three males who called them “f**ing Jews” and “Your f**ing people are killing our innocent children” and punched one of the teens. Security footage has been obtained and charges have been filed. 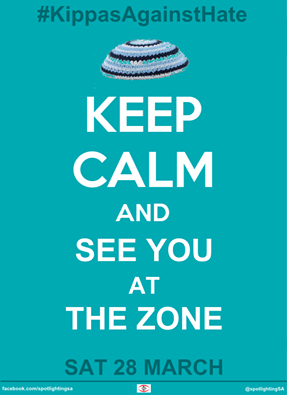 The community has responded with a call for everyone to show solidarity and stand up against racism by appealing that as many as possible come to The Zone wearing a kippa or a hat and going to see a movie. The event was held this past Saturday to tremendous response. Now that’s what I call a yarmy army! South Africa is of great strategic importance. 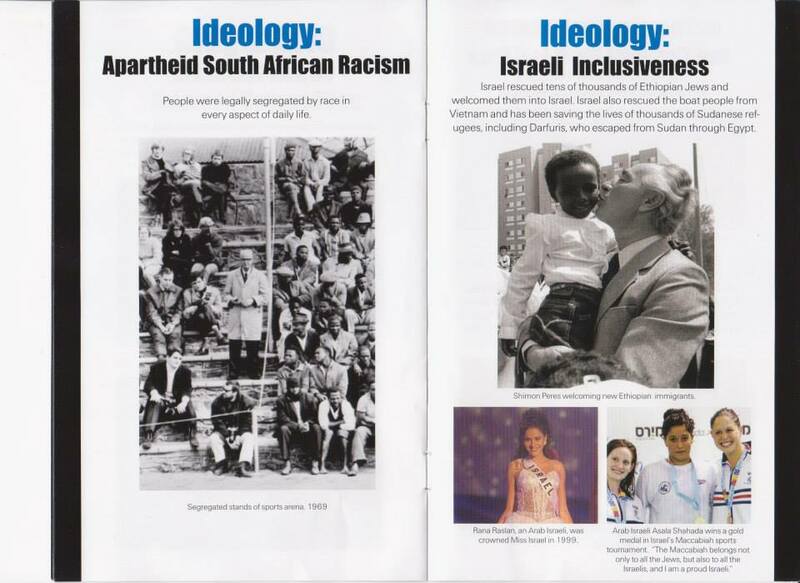 Often dismissed because relations between Jerusalem and Pretoria are strained, South Africa was the host country of the UN Conference against Racism which birthed BDS and their merry band of morons. 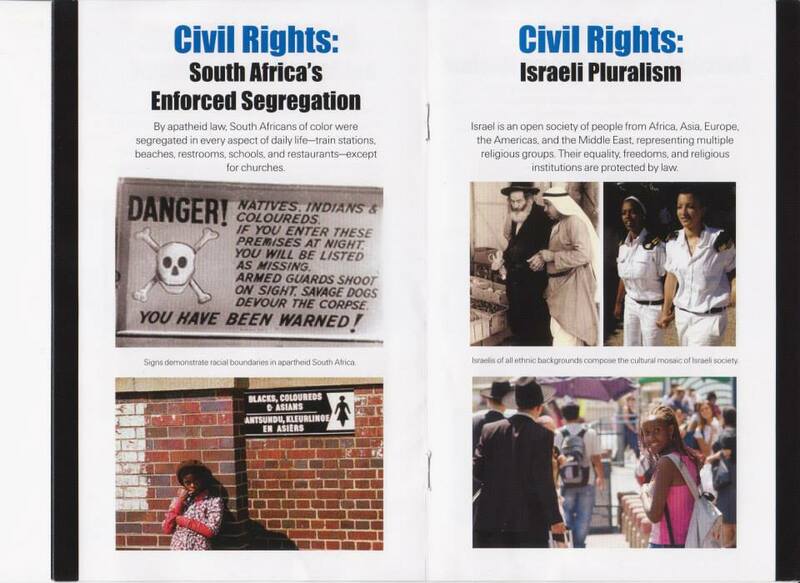 South Africa is also the birthplace and final resting place of Apartheid which forms the central charge that Israel’s detractors level against the Jewish state to question her right to exist. Whatever happens in South Africa is seen as the benchmark by which we measure racism. Dismiss this at our peril! I grew up in South Africa and although I no longer live there, choosing instead to make Israel my home, my love and connection for the Jewish community remain strong and deep. This is a community, who has a strong Jewish and Zionist identity and is cohesive and strong have contributed well above their weight to the country. With a noble and proud history of activism, both against the repugnant Apartheid system and in love of our beloved State of Israel, South African Jewry can stand tall and strong. It is very distressing to see what is happening and I cannot help but cry for the beloved country. Being so far away makes me feel so helpless but at the same time I look at the tremendous courage and defiance shown by the community and their supporters and feel a huge sense of pride. You rock your strong, proudly South African and Zionist selves! Why are so many glomming on to anti-Semitic rhetoric or following BDS like blind sheep? Is it a latent hatred or are they feeling so disheartened and let down by economic conditions that the world’s most convenient stereotype of blame, the Jews, are the target of their rage? Many of the protesters bussed in to these rallies have no idea why they are there but there is a fair contingent who are drunk and delirious with hatred. To whom much is given, much is expected. I have been extremely privileged both in my career and as an Olah to not only have the benefits afforded new Olim but also the opportunities to understand the country from a perspective that not many get to see through leadership programs and experiences. It is in this light that I feel it imperative to speak up about what it was like to grow up in the Apartheid era. The word Apartheid is very emotive and provocative. It is being used by the anti-Israel camp to call into question Israel’s right to exist as a sovereign state and this is supported by the BDS (Boycott, Divestment and Sanctions) campaign and its annual hate fest that takes place in March across university campuses around the world known as Israel Apartheid Week. 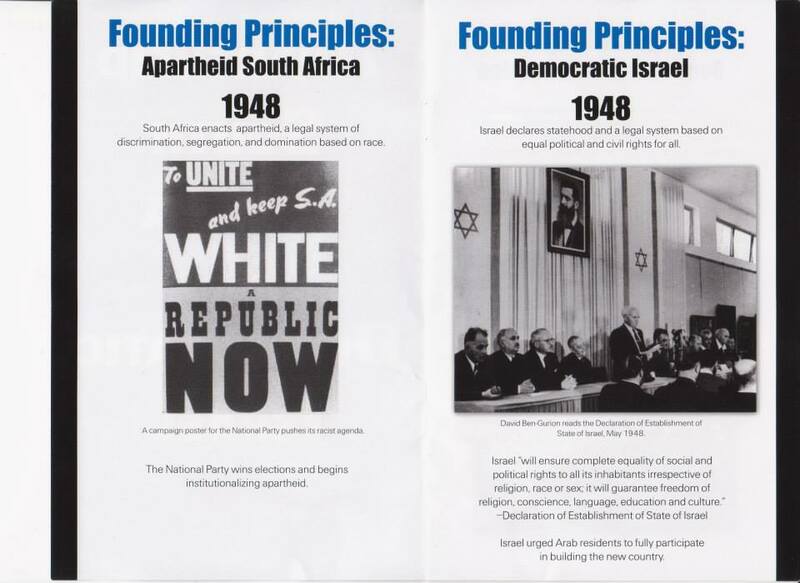 By painting Israel as a pariah state in the same colours as Apartheid South Africa it seems logical that the Jewish state should receive the same treatment, right? Wrong. Israel is not a perfect country and I would challenge anyone to find a country that is. Racism certainly rears its ugly head in Israel just as it does in every country in the world but it certainly is NOT an Apartheid state. The singling out of the Jewish state at the expense of other countries that do have discriminatory laws not only insults the profound suffering of South Africa’s victims of Apartheid but also exposes the true nature of those who subscribe to this rationale – anti-Semitism. The Apartheid years were deeply painful for South Africans. For many of us they are hard to talk about. Many of us feel ashamed that we benefitted at the expense of our fellow citizens who were discriminated against and treated like they were second class. Many of us feel ashamed because we did not do enough to fight the system. I feel a responsibility to speak out about what it was like to live in Apartheid South Africa, not only to give voice to those who suffered and whose experience has been hijacked as part of a racist campaign against another nation but also for Israel, the country that has given me a lot of opportunity and is the target of such derision. I have always been a curious, politically aware person and was no different as a child. I started to ask uncomfortable questions about what I was observing around me, much to the concern of my teachers and parents. Asking too much could get you or them into real trouble! I had an idyllic childhood, living in the very liberal suburb of Yeoville in Johannesburg, in the hub of Jewish life. I also lived opposite a park and this provided me with endless opportunities for fun and observation. The same could not be said for my peers of the same age who were not white. Children were taken to play in the park by their “nannies” (black domestic workers) who kept a careful eye on their charges. I remember asking my mother why nannies sat on the grass all the time. Didn’t they like the benches? My mother tried to explain to my childish curiosity that nannies were not allowed to sit on the benches. Or go to the same ablution facilities. I could not comprehend this. Why? What had they done that was so wrong? When I was about eight years old I made friends with Minnie. Minnie’s mother was a domestic worker and she went to school in the rural areas of the country. She was not afforded the level of education I was, being subjected to the “Bantu education laws” which ensured that South Africa’s black citizens received an inferior education. Fully equipped classrooms with text books, individual desks, electricity and extra mural sports and activities were not afforded to my peers who were not white. During the school vacations, Minnie came to stay with her mother, in her tiny room at the top of an apartment building which was where domestic workers stayed. I remember being warned by Enoch the doorman that being friends with Minnie could get me into serious trouble. It wasn’t enough that Minnie couldn’t swim in the public swimming pool or come to ballet class or get the same education I did, the friendship between two little girls, barely in double digits was considered a liability. This was South Africa under Apartheid. There was no freedom of the press , no freedom of movement. It was regime where multi-racial friendships were viewed as suspicious and where grown men and women were robbed of their dignity and discriminated against. It was a regime where men and women caught without their “pass” (identity) documents or out after their curfew were rounded up by heavily armoured police vehicles. There was no freedom of association and the laws of Apartheid not only robbed non-white citizens of their civil liberties but governed every aspect of life from sexual relations to education, to ablution facilities. There was no aspect of life for a non-white citizen that was not governed by the racist Apartheid laws. Democracy was a concept only enjoyed by the minority as only white people could vote. Then one day Minnie stopped coming to the park during vacations. I will never know the reasons why, perhaps her mother found a new job. I joined a Zionist youth movement and we were taught to ask questions. Our social consciousness was raised. We started to speak out against the system. On the 17th of March 1992 a national referendum was held, calling for an end to Apartheid. South Africans voted in their numbers to finally end this hateful, racist regime. Many of the Israel detractors fail to understand that the South African solution is not one size fits all. 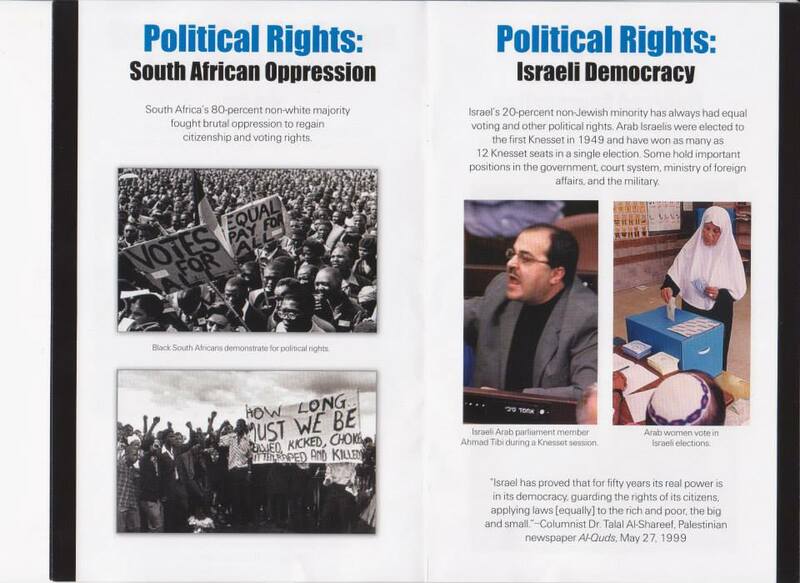 South Africans wanted to join together while Palestinians and Israelis each have their own national aspirations. To try and enforce the South African solution on us is patronizing and belittling to both sides. The 27th of April 1994 was a profoundly emotional day. South Africans from all walks of life stood in endless lines to cast their votes. This was my first time voting and I stood in line with Johanna, our domestic worker, who couldn’t believe that finally she could vote. We both cried. I remember visuals of the elderly in rural areas, brought to polling stations in wheelbarrows, so excited they were to finally see the birth of a democratic South Africa. The post-Apartheid road has been a long and arduous one, fraught with complexities. South Africans tried to bring healing with the establishment of the Truth and Reconciliation commission where both sides could express pain or remorse. Perhaps there will come a day when Palestinians and Israelis can have their own truth and reconciliation process. 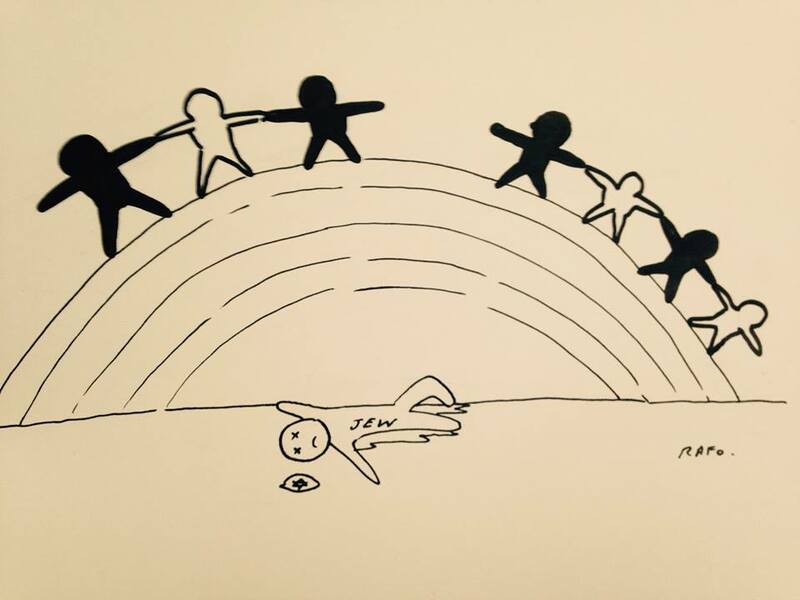 It is painful but to hear each other’s experiences and acknowledge mutual pain may bring much needed healing. Israel is a vibrant and flawed democracy but is most certainly NOT an Apartheid state. Our detractors have stolen this from the victims of Apartheid – it is time we honour them by taking it back.